I love chicken. Seriously, I think I might have to join an “anonymous” group to get over this. I know there are a few chicken nay-sayers out there. They think chicken is boring and dry… why eat chicken when there’s juicy medium rare beef and fantastically fatty pork parts. To be honest, I have never ordered chicken at a restaurant. Well, maybe a chicken sandwich, but otherwise I keep to my own chicken. And not that I like to toot my own horn, but I make a damn good chicken. The recipe is simple. Flatten the chicken and then drizzle with olive oil. Season with salt and pepper and then toss on a hot grill skin down. I sliced 2 lemons in half and thew them on the grill as well. Let the chicken cook for 5-7 minutes and then turn it 45 degrees. Allow the chicken to cook for another 10 minutes and the flip. Squeeze the lemons on the chicken and close the grill. Turn the heat to medium let the chicken cook for about 25 minutes or until the chicken is cooked to about 155 degrees. Then wrap the chicken in foil and let it rest for 10 minutes. 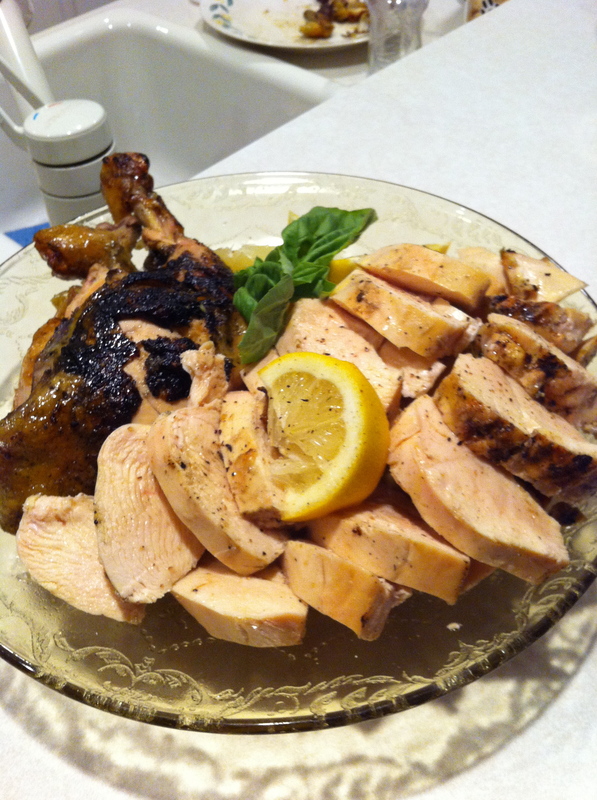 Slice the chicken and re-season with lemon juice, salt and pepper. Serve hot. Yum-o. I would love to have that lemon chicken on my plate. I think me and you are very similar because I absolutely love chicken as well. I never get tired of eating it for some strange reason lol. This grilled lemon chicken looks amazing. I really enjoyed reading this post.